A teenage boy shot a 15-year-old girl and then himself at their school premises in Soldier Bazaar. Sadly, there is nothing unusual about teenage suicide. Nothing new about the reason behind it either. 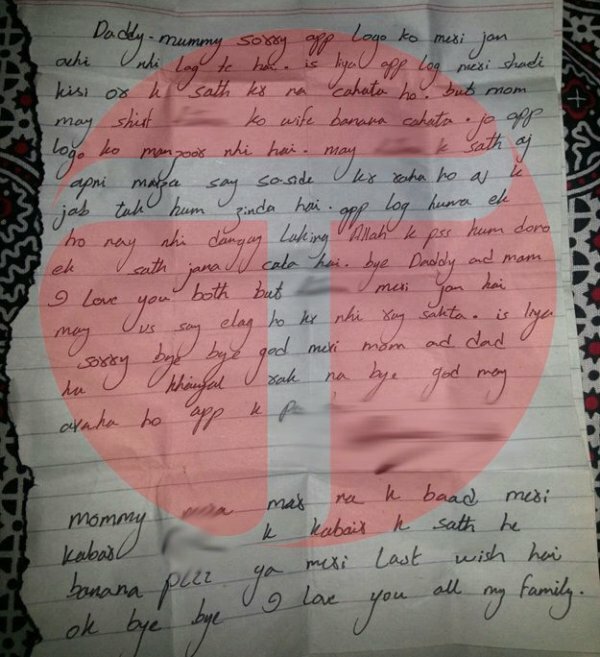 Recently, two teenagers, aged 15 and 16, killed themselves at their school in Karachi, apparently because they were ‘in love’ and did not expect their families to consent to them marrying each other. According to The Express Tribune, the boy shot the girl first as per her request before pulling the trigger on himself. 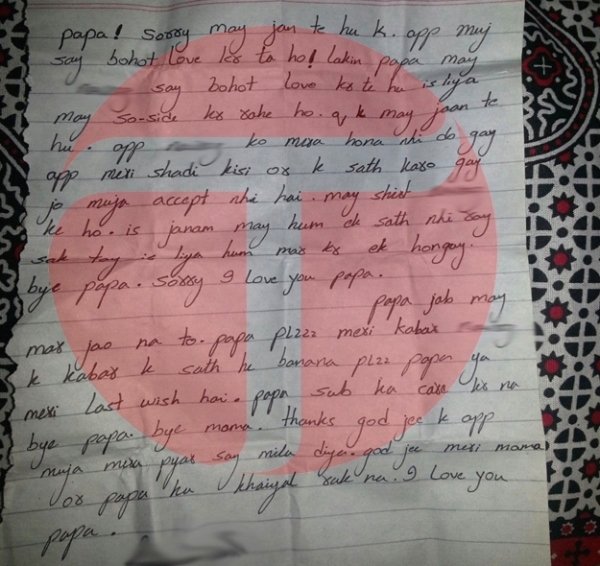 The young couple had left behind two suicide notes for their parents. Both of them said that they were aware that their parents would never allow them to get married which is why they decided to take their lives. Both letters, which appear to be written by the same person, requested the parents to honour their dying wish to be buried next to each other. Whatever the facts of the matter, keeping in mind that in such cases the facts are never clear, the reality is that these two children died and our hearts go out to their families during this terrible time. May the two children rest in peace, and may Allah (SWT) give their families strength to bear their loss. Teen years are never easy. With turbulent hormone levels and uncertain judgement, it is hardly surprising that suicide is a significant cause of death amongst teenagers. It is as true that parenthood is not easy either, and being a parent of teenage children is particularly difficult. Like any profession, being a parent is learned on the job. To expect a ready-made sage to emerge as a result of a nikkah and the process of childbirth is naive in the extreme. Therefore, to blame the parents for this or any similar case is cruel and indecent. The reaction to this awful incident is what invites comments the most. Reports of this tragedy elicited scores of comments within the day, most of which passed a harsh sentence on the parents. Strange, because which of us is without error as a parent and can throw the first stone? And how wrong is it to jump to conclusions at a time like this, particularly when all is conjecture and none of the facts are clearly presented before us? Even were it otherwise, it is obvious that our compatriots stand in need of sensitivity. Other commentators pointed fingers at Hollywood, Bollywood, local television plays, Indian and others, computers, iPads, mobile phones, and free phone packages, 3G networks, video games, co-education, little religion, no love and too many firearms. I looked but could not find any allusions to the CIA or Mossad, but I am sure they will turn up in due course if they’re not already there, camouflaged by the reference to movies. We must learn the sheer inevitability of technology. It is like the sexual urge. It will happen and suppressing it will create problems. You can only learn to use it in the right way. So TV will happen. Computers will happen, as will books, movies, cartoons, and YouTube. Ban it as much as you will. People will find them, read them, see them, hear them, and more so if they are banned. I would not have cared two hoots for it but because it was banned, I admit to having read the book that was set to become Salman Rushdie’s great flop before it was banned. The thing that can and must be controlled in some way is the easy access to firearms. What is being done about this? And about the reason why so many persons possess firearms in the first place? The possession of firearms is very often a result of a very real perception of a lack of security. Even so, the possession of firearms is open to abuse. Remember how Salman Taseer was killed? Security is a state concern which it has shamelessly shirked along with most of its other responsibilities. What is being done to make this country more secure, other than making it over to arbitrary justice handed out by unqualified courts? And there are many other persons who possess firearms with a view to aggression rather than self-protection. What is being done about them? The other point in this case is that the young boy, being an Ismaili, would not have been accepted by the girl’s family, or so it is reported in the news. Who knows what the facts of the case are, as I said before, and I stress on this again. Certainly, the local SHO had no reservations about claiming that the two were very young and came from different communities, and ‘which parents would have allowed this?’ It could be that he was referring to them being underage, but he could equally be referring to their belonging to separate communities. And that is probably the saddest thing of all, that the factor of community is ever an issue. Even if that is not the truth in this particular incident, there is the fact that the SHO seems it fit to say so, the fact that so many people would agree that two different communities may not intermarry, even if they both call themselves Muslim. If this is not a problem of our own creation, what is? Why, at every instant, do we blame someone else for our problems? Like other countries, Pakistan has a host of issues. It is time we recognised that our society and no one else is at fault in most tragedies that occur here. We have lost the ability to share, coexist and debate as a society and the results are before us. If you go out in any of the cities in Pakistan and smile at a stranger on the road somewhere, he will look at you stonily and walk on. Not one person will smile and offer you courtesy, not one will make way on the road, open a door for you, or smile and thank you if you do. By these standards, all the persons in Pakistani cities should kill themselves forthwith. This is not an issue created by cell phone packages, by Bollywood or co-educational schooling. It is not the fault of RAW, the CIA or Mossad. This is us, the people of Pakistan ourselves as a society. Let us forget the Golden Gate Bridge and acknowledge the issues right here, in Anarkali Bazaar, in Landhi, Korangi, Islamabad, Rawalpindi, Peshawar and Quetta, and recognise the ones who created them – we and I. When something goes wrong, let us examine where we went wrong, and take pity on those who suffer as a result of these tragedies. It’s time to cultivate some sensitivity, a modicum of sense, and learn to live in this world with grace. It is a world where technology rides on our shoulders and a world where all communities must learn to live together now, or die. ET,you shouldn’t have printed the deceased boy’s letter.Could you please explain why you felt the need to do so?Perhaps it would help increase your readership . This is a very sad incident and we cannot imagine what the families are going through.Did you guys even think about the consequences of publishing this letter ,it only makes matters worse for them.Already the people are being so judgemental about them. I have a problem with the title of this article. If ‘we’ are responsible for the teenage couple suicide, why is ‘Pakistan’ being confronted here? We Pakistanis, I believe, are the luckiest people on this planet. The word ‘Pakistan’ is always readily available for our ridiculing. It also comes in handy during our escape from our responsibilities. We would say at the top of our lungs, “Ye Pakistan hai, yahan sab chalta hai!”. Yes, the same phrase comes as the finest excuse to mind when we tend to do something abominable or wrong.